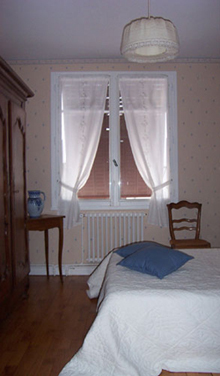 Our students are offered individual accommodation with local French families in Suèvres or nearby. We have known the village for over forty years and so all the families that we use are personal friends who enjoy the company of our students. You will get a clean and comfortable bedroom, breakfast and all your evening meals with your French host family, except the first night when you have dinner with us and the last night when we eat out in a local restaurant. The cost of your accommodation and meals is included in the price of the course. Some students may wish to come to Suèvres with friends or family, thus combining their course with a holiday. For students who prefer not to live en famille, accommodation in a local gite, hotel or campsite can be arranged, but would not be included in the price of the course. However, we do recommend you stay with one of our French families so that you can be totally immersed in the experience. Your hosts will make a point of speaking slowly and clearly and encouraging you to talk over the dinner table.